This was an interdisciplinary symposium, held at Lancaster University, UK, about the immaterial/intangible, which aimed to bring together people with different perspectives to negotiate the imperceptible. The seminar was introduced by Dr Sarah Casey – Lecturer in the Lancaster (University) Institute for the Contemporary Arts but also an artist who explores the limits of visibility and material existence. Sarah asked us why we should consider the materiality of nothing, answering her own question by saying that ‘no’ thing implies the lack of ‘some’ thing and suggested that we tend to step around the intangible rather than try and deal with it directly, as exemplified by the Romans who didn’t have a zero in their numerals. 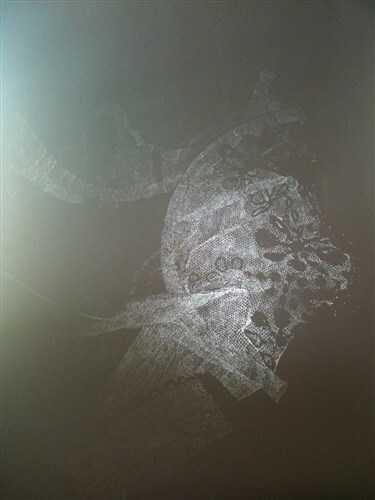 In her introduction Sarah asked us to consider how we create something out of nothing and used erased drawings as an example of work that focuses on space and absence. With just a little research I can see that this topic has exercised a number of artists. For example Robert Rauschenberg explored the extent to which art could be created by removing marks rather than making them (see Erased de Kooning Drawing, 1953) and a number of other artists have explored invisibility and aesthetic absence. Interestingly, during the day, as we listened to presentations I sat next to artist Gerry Davies who was almost continuously drawing in a small notebook. I was intrigued by how he used the rubber on the end of his pencil as much as the graphite, creating and removing marks in equal measure. Sarah suggested that we need absence and space for imagination, interpretation and reflection. I found just this 10 minute introduction to the day fascinating and am grateful that Sarah and Lancaster University opened this seminar to the public. There were many stimulating ideas to come out of the day, which I hope to find time to record in at least one future blog post. Although my understanding of much of what was talked about is very limited, I am intrigued by all the ways in which we can align ideas such as invisibility, absence, silence, immaterial, emptiness, speculative, contingency, indeterminacy, invisibility and nothing, to teaching and learning, particularly teaching and learning in the online environment where it is so easy to be invisible to each other. This has often been seen as a negative aspect of online learning, but maybe this is a short-sighted view. For those who are interested in the programme for the day – here it is. Thanks so much for that Jenny. I have been thinking about your post on and off since I first read it yesterday. As we share an interest in online learning. it’s not surprising that I also thought about absence/presence, lurking/ learning by onlooking as I read what you said. I thought about a concept ‘social translucence’ – quieter ways of making our presence known- https://scholar.google.co.uk/scholar?hl=en&q=social+translucence&btnG=&lr=lang_en&as_sdt=1%2C5&as_sdtp= that seems to have arisen from research into supporting collaborative working online. I looked at this over 10 years ago before I was aware of/ active in Social Networking sites.